The doors to the cafeteria will be locked promptly at 7:10am. After 7:10 students will have to enter through main office door. Any student that is new to the building, please report to the main office during 6th period to have your picture taken for ID purposes. A reminder to all students…please make sure you bring and wear your ID tomorrow and every day. If you have lost your ID you will need to go to the main office to purchase a new ID. IDs are $5. Students who forget their ID will be issued an office detention for the first time and then further consequences will be issued each time. A reminder to all students and teachers! Homeroom period starts at 7:20. You should be out of the halls and into your homeroom classroom by that time. Anyone arriving to homeroom or class after 7:20 will be marked tardy by their teacher. Students arriving to school after 7:20 will have to enter through the main entrance and will need to get a pass from the tardy station by the main office. If you get marked absent because you are late to class you will not be able to leave class and will have to straighten your attendance out on your own time. Please remember that too many tardies and absences can contribute to absences from class and you will need to attend buyback to make up missed time. Attention staff: the focus group session on attendance and tardies is cancelled for today, but will be rescheduled for a new date soon. Just a reminder to students, the 4th floor is closed for testing during MCAS. All students with lockers on the 4th floor must get their belonging from their lockers in the morning. Additionally, a reminder that he library will be closed to all students for studies and lunches during the MCAS – Tuesday Wednesday and Thursday this week. It will, however, be open after school on these days. Teachers…while the MCAS is going on, please make sure to send your attendance down to the office first thing in the morning prior to moving classes, if your attendance is not collected. Congratulations to Tamiah Hutchful as she was selected as a T and G Super Team ALL STAR for the winter season!!!! Attention students who are interested in performing in the 2016 Culture Show. Auditions will be held on Wednesday, March 23rd and Thursday, March 24th at 2pm in room 431. Auditions are mandatory if you are considering performing in the show. Please see Mr. Coonan in room 431 or Lynn Thisbault for questions. Are you ready to find out who will win the Mr and Ms North High contest? Come support the finalists and hear the results live at the rally Thursday after school in the auditorium 2-3. Admission is free!! Two new scholarships have been added to the red book; the Thomas Early and the Lucetia Bancroft scholarships. All seniors should be applying for these two scholarships. Students can access the application in the 318 Guidance office. Many, many seniors have not yet completed the FAFSA. If you want ANY financial aid to help pay for college this fall, you must complete the FAFSA THIS MONTH. Waiting until April is a terrible idea. See Gear Up for help. Seniors – please bring in any college acceptance letters that you have received to your Guidance Counselor. Martin Luther King (MLK) scholarship deadline is April 1. So far, no one from North has applied for this scholarship. Please get your applications in – apply for this scholarship!!!!!!!!!! Fitness Club on Wednesdays after school from 1:45-2:40pm is looking for members. Come see Ms. Juliamy or Mrs. Distefano to sign up. If you are a student who owes buyback, you have the opportunity to stay after school Tuesdays, Wednesdays and Thursdays in the library from 2-4pm. You must bring work to complete with you during these times. For many of you buyback is needed in order to graduate, please use this opportunity to get your buyback completed. All Juniors should be signing up for the SATs May 7th. The deadline to sign up is March 31st. Worcester Public Schools is offering AP Art History next year. This class will meet 2 nights a week at the Worcester Art Museum and food will be provided. This is a great opportunity to broaden your high school experience and enhance your college applications. In addition to Advanced Placement credit, the program is planning a trip to Italy next spring to offer first hand Art History experience. See your guidance counselor for details. Attention all Juniors!! Windbreakers for the class of 2017 are now being sold. It’s only $35 so make sure you buy one to support the class. Jackets can be customized. All seniors should be checking the Scholarship Book in the 318 Guidance Office on a regular basis as scholarships are being added almost daily. A reminder that the Dr. Martin Luther King Scholarship deadline is April 1. Recreation Worcester is a free after school program that is held at 5 local schools. The program is held from five to seven and consists of academic, arts, and athletic components. The program will offer open gym and homework help. Any interested students can come pick up a flyer and registration form in the main office. Food will be provided to students who join the program. Please see Mrs. Milonopoulos or Ms. Juliamy for information. Perfect attendance incentives will be given for third quarter….students, try your best to come to school every day and you will be rewarded at the end of the quarter! Attention Seniors-If you are applying to a private college you may have to complete a CSS profile for financial aid. If you aren’t sure if your school is a CSS profile school, come down to GEAR UP to find out. Attention Seniors: Gear UP would like to start our annual SENIOR SUCCESS wall! Please bring in a photo of yourself so we can post it on our bulletin board along with you college acceptances, awards, and scholarships! Tuesday Cooking Club has started and what a hit it is!! 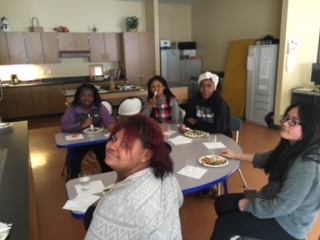 The students are not only learning how to cooking healthy delicious meals, but learning nutrition facts about what they are eating. Students are working closely with Mr. Turano to meal plan for healthy meals to cook each week. 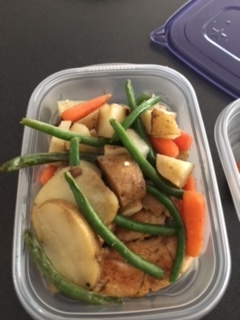 This week was fresh veggies, grilled chicken with spices and home made baked slices potatoes. North High smells so good while they are all cooking up a storm!!! 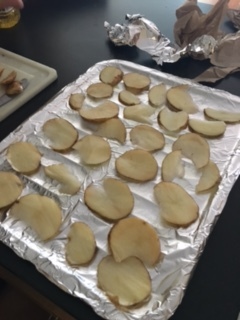 Each student has a task in the kitchen and purpose. In the end they all get to enjoy a delicious meal!!! Job well Done!!!! Our future Chefs!!!! Rehearsal today after school for faculty and student-adult roles in Up the Down Staircase in room 234. There will be a career club meeting this Thursday, 2/11 after school in room 213. Attention Students: The Providence Holcom bus stop has now been removed from bus 28 and is now Bus 2. Any student riding that bus and that needs an ID change to reflect this, please see Mr. Creamer in the 4th floor office during period 6. The senior vs staff basketball game is on Friday, February12th. Tickets will be sold at all lunches for $2. Any senior willing to play may sign up in room 106, but may not be on the Varsity or Junior Varsity basketball team. Teachers may sign up by the teacher mailboxes. Students should wear their class by colors. Wednesday: Sports Day- Represent your favorite sports team by wearing their jersey or color scheme. Thursday: School Spirit Day- Show your pride for North High. National Honor Society General meeting this Wednesday after school in room 207. Plan to stay 1hour. If any teachers have CSI nomination forms, please submit them to the envelope in the main office by today. Any student interested in participating in the Brain Bee should see Mrs. Lauritsen in room 302 or Mr. O’Connell this week to register. There is MCAS tutoring every Tuesday, Wednesday, and Thursday for ELA and Math. Tutoring is very important to attend as passing the MCAS is a graduation requirement! Buyback and Plato will be offered over February vacation on Tuesday, Wednesday, and Thursday the 16th, 17th, and 18th from 9am-12pm. Priority will be given to juniors and seniors. You do not need to sign up, just show up in the cafeteria. If you owe buyback, you must come with work to complete. MCAS Support in math will also be offered on Tuesday, Wednesday, Thursday, and Friday from 9am-12pm. Juniors/Seniors who have not passed the MCAS should definitely come as passing the MCAS is a graduation requirement!! HOSA is sponsoring a Carnations Sale! It’s a great way to show your appreciation for that special someone and support HOSA! There is a limited supply of flowers so be sure to get your order in ASAP! Orders for Red or Pink Carnations will be taken during lunches only today through Thursday; flowers are $1 each. Sale ends 2/11. Flowers will be distributed during homeroom on 2/12. There will be a HOSA meeting on Thursday 2/11 in Rm 305. Please be on time as we will have a guest speaker from UMass Medical School. Students participating in FOCUS ON YOUTH program, session two will be held on Thursday. Permission slips for this program are due to Mrs. Remy-Lidonde in RM 305 by Tuesday. The Pennies for Patients fundraiser is in its planning stages for late March. This campaign is OPEN to ANY student interested in volunteering or looking to increase their community service hours. Please see Mrs. Beriau for details. A representative from the Leukemia/Lymphoma Society will be speaking to student volunteers on Thursday at 1:45 PM in room 305 for a brief informational meeting. Do you think you have what it takes to be Mr. or Miss North High School? For more information and/or to sign up with Ms. Acheampong in 411, Ms. Houlihan in 325, or Ms. Nunez in 201. Juniors, any student who is interested in participating in the SAT prep program, “Let’s Get Ready”, must fill out an application online. There is an orientation today for any student interested (even if you have yet to sign up) at 5:30pm. Classes will start after vacation. Afterschool programming has started. There are many opportunities available to students such as; tutoring in the library, CTK THE 84, Cooking Club, French Club, Axis of Hope, MCAS Tutoring, and so much more. Sif you are already signed up please report to the assigned room immediately at the end of the day. Students who stay after and participate in one of the offered after school programs will be able to take the 4pm dismissal bus (certain exclusions apply). For further information or to sign up for a program, please see Ms. Juliamy in room 301. We are continuing our sock drive and we ask that every student bring one pair of socks – just one pair of socks can make a huge difference to someone without shelter. This is not a competition between classrooms, just a simple act of kindness. The sock drive will continue until Friday, February 12th. We are currently at 190 pairs of socks and our goal is 500 pairs. North High School will be donating these socks as a gift of love to the homeless. You can bring your sock donation to each floor office or the main office. The Greater Worcester Scholarship application process is now open. Every senior should be applying for this scholarship. One application enters students into a pool of over 125 scholarship opportunities. The deadline for asking for counselor recommendations is March 1. The scholarship deadline is March 7. See your Guidance Counselor for details. The Boys and Girls Track Team took on the District E Invitational Championship this weekend. The Girls team achieved their highest finish in program history placing 7th overall. The Boys finished 10th. All our other individual competitors performed very well. We are a young team that is only getting better. Buyback and Plato will be offered over February vacation on Tuesday, Wednesday, and Thursday the 16th, 17th, and 18th from 9am-12pm. Priority will be given to juniors and seniors. You do not need to sign up, just show up in the cafeteria. If you owe buyback, you must come with work to complete. Rehearsal for the cast of “Up the Down Staircase” will be held afterschool today in room 234. Tyanna Alexander, Faustina Owusu and Camila Penaherrera please see Mrs. Goldstein during homeroom today, Tuesday, February 9th. Cheerleading Practice will be canceled today. There will be practice on Thursday 2-4. To any boy interesting in playing volleyball this spring: There will be an important meeting on Tuesday, February 9th immediately afterschool in room 202. Please see Coach Vaughn with questions. Juniors, any student who is interested in participating in the SAT prep program, “Let’s Get Ready”, must fill out an application online. Representatives from LGR will be here this week. See Mrs. Mallaghan if you need help applying. Let’s Get Ready will run Mondays and Wednesdays from February 10 to May 4. The program provides books and small group learning in Math and English and is free of charge. See Mrs. Mallaghan for details. 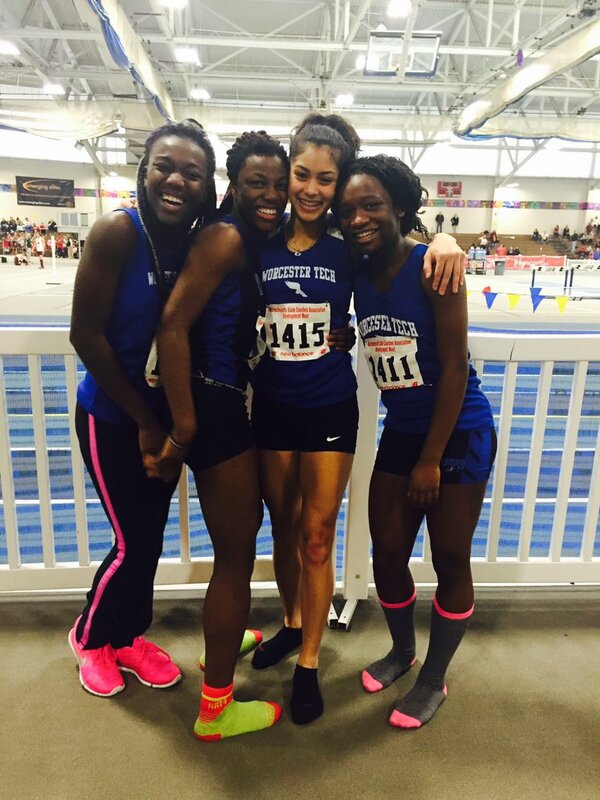 *The Girls 4×200 Relay team of Leilani Torres, Bernice Mensah, Doreen Baubeng, Adja Sackor placed 2nd (1:50.69). 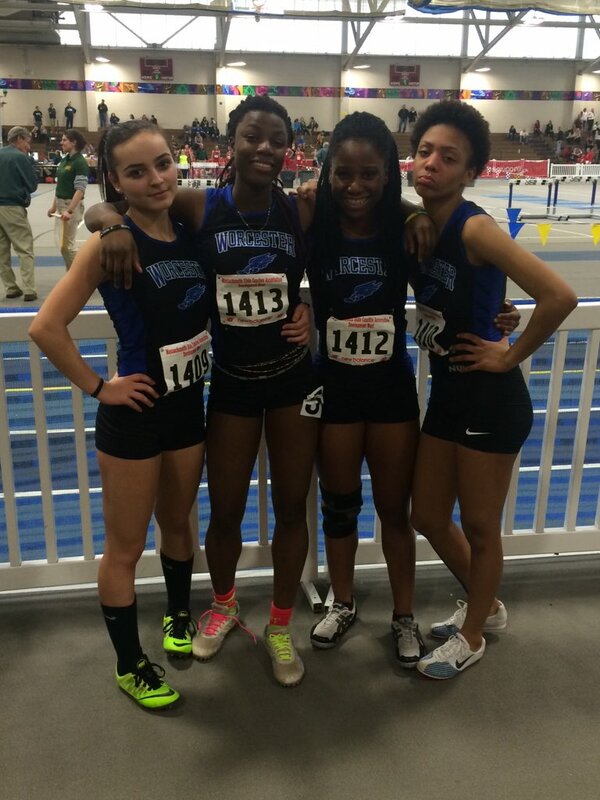 The girls entered with a season best time of 1:54.23, an improvement of nearly 4 seconds. *The Girls 4×400 Relay team of Faustina Owusu, Denise Hoxha, Essence Martinez, Adja Sackor shattered their previous record time of 4:37.26 with a new 2nd place time of 4:17.38, nearly a 20 second improvement. *Adja Sackor won the 55M (7.42) beating out her sister Fanta Sackor for the school record. *Bernice Mensah placed 6th in the 55M (7.62) just off her season best. *Edward Boamah placed 3rd in the 55M with a personal record of (6.74). Edward and George both decided to switch their events for the first time and both produced resume results. Daily Announcements 1/4/16……It’s MCAS TIME!!!!! MCAS Tutoring for Biology will be starting tomorrow, January 5th at 2pm in the cafeteria. If you are a repeat 9th grader, 10th, 11th or 12th grader taking the Biology MCAS you absolutely should participate in Tutoring. Snack and bus passes will be provided. Auditions for the Drama Club’s production of “Up and Down the Staircase” will be held in room 234 afterschool on Wednesday and Thursday. Auditioners only have to come one of the days to read from the script. Any questions, see Mr. Savage in room 234. HOSA officers…There will be a meeting on 1/6 right afterschool in room 305. Please be prompt. Those participating in HOSA, there will be a meeting on Thursday 1/7 right afterschool in room 305 with Mrs. Remy-Lidonde. Ranking with rise and fall as the season progresses, however, I believe it is important to highlight the achievements of our student athletes as they represent what is great about our schools, track program, and to provide the support of their efforts moving forward. The Boys and Girls Track Team closed out the winter vacation week with another stellar showing at the MSTCA Winter Speed Classic at the Reggie Lewis Center in Boston on Wednesday. Highlighting the Girls team was Junior Adja Sackor. Running in the 300 M for the first time, Adja placed 2nd with a time of 42.98. This time has qualified her for the Division 1 State Championship and the Eastern States Championship at the Armory in New York. Adja’s time broke her sister Fanta’s school Record. 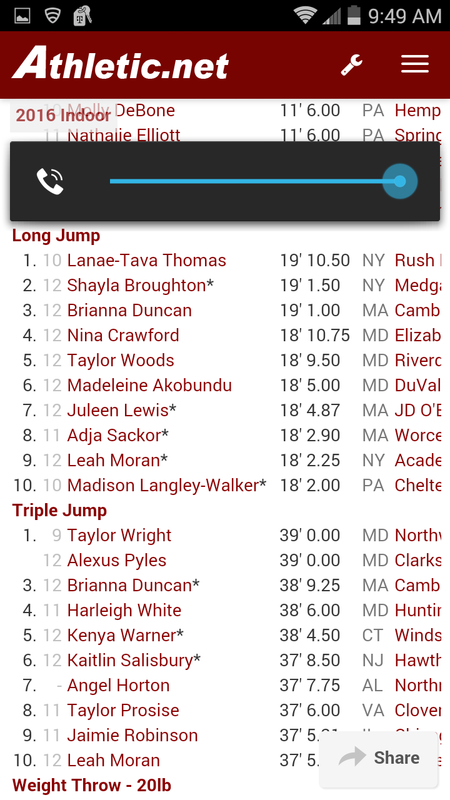 Adja went on to place 2nd in the Long Jump. The Boys 4×200 Relay team of Levone Thomas, George Biney, Colbert Agyei, and Edward Boamah placed 2nd. The boys relay team is Ranked #4 in MA and 43rd in the US. 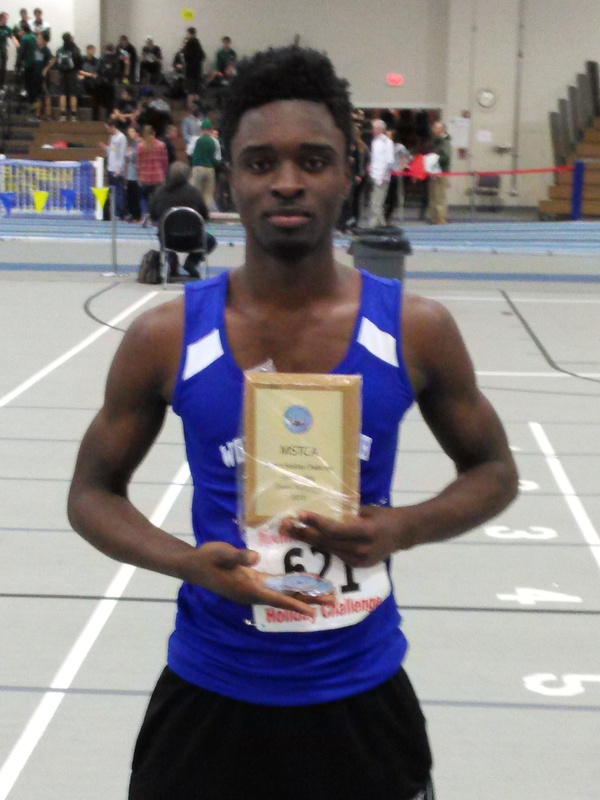 Congratulations to North High Senior Edward Boamah was named Boston Holiday Challenge Sprints MVP. This honor was well deserved! At this time, all staff and students should have on their IDs. If you do not have your ID you must wear a green temporary ID. ATTN: TSTT Students: There will be a meeting on Thursday, December 17th at 2pm in Room 411. This is a mandatory meeting for all TSTT seniors. If you are unable to attend the meeting, please see Ms. Acheampong in room 411 before Thursday. SPOTS FOR ACTS FOR OUR UPCOMING LIP SYNC CONTEST, sponsored by the student council, ARE GOING FAST… PLEASE SEE MR. MARZILLI FOR ENTRY FORMS IN ROOM 404.. AND RETURN THEM AS SOON AS POSSIBLE. CASH PRIZES WILL BE AWARDED FOR THE TOP THREE PERFORMANCES. THE FIRST Rehearsal will take place next Wednesday December 16 in the Auditorium. Attention Superintendent’s Advisory Council-There will be a Superintendent’s Advisory meeting today at Doherty High School. We will be leaving from the main lobby at 8:15am. Please listen for the announcement of our departure this morning. HOSA officers. There will be a meeting on 12/16 right afterschool in Room 305. 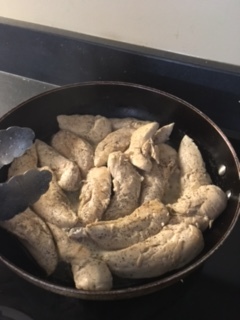 Please be prompt. Those participating in HOSA, there will be a meeting on Thursday 12/17/15 right after school in room 305 with Mrs. Remy-Lidonde. Please be prompt as this meeting will be short. The cheerleaders will be selling bows at all lunches for $2 this week!! There will be a mandatory meeting right after school for students that want to participate in the Concert for Paris in room 215, Wednesday, December 16th, 2015. Ms. Gonzalez and Mrs. Lupafya will start the meeting promptly at 1:43. Any additional questions before the meeting contact Ms. Gonzalez in room 215. Any girls interested in joining softball please meet in room 207 Thursday, December 17th immediately afterschool. Please see Ms. K with any questions. The junior class Christmas Movie Night is coming up on December 17th from 6-8pm. Get your tickets for only $2 at all lunches or contact the class officers for tickets. The tickets also include a 50/50 raffle. So come and enjoy “How the Grinch Stole Christmas”. Attention all students: No students will be allowed to wait in the foyer by the auditorium afterschool. Additionally, a notice to any student that wishes to attend basketball games this season. There will be absolutely no backpacks or bags allowed in the gym for games. Bags will not be stored for you. Furthermore, bags will not be able to be retrieved from your locker after the game concludes, so please make sure you leave your bag at home before coming to the games. It’s that time of year again….Upon our return from the holiday break MCAS Tutoring for Biology will be starting. If you are a repeat 9th grader, 10th, 11th or 12th taking the Biology MCAS you absolutely should participate in Tutoring. It will begin Tuesday January 5th at 2pm in the cafeteria. Snack will be provided. A group of 20 North High students were recently inspired on a field trip to the Hanover Theater by motivational speaker Mike Smith. As a result these students have decided to initiate a North High School Community Service Project-Socks for the Homeless. We are asking every student to bring in ONE pair of socks-just one pair of socks can make a huge difference for someone without shelter this winter. If every student donated one pair, we would be able to collect over a thousand pair of socks for the homeless. This is not a competition between classrooms or homerooms…it is simply an act of goodwill for people who need our help. Hopefully, it will become an annual North high community Service Project that will grow each year. The guidance offices on each floor will be the collection sites. Please join this effort…one pair of socks. We start tomorrow, December 1st and will end on December 18th. Let’s show our community that we are North High School and we are willing to make changes! A reminder that the lunch schedule has rotated. Please follow the bell schedule when dismissing your students to lunch. For those having second and third lunch, please make sure you are not releasing your students until the bell rings for the start of the lunch, not the transition time built in. This time is specifically built in to allow the cafeteria staff and custodial staff time to prepare for the next lunch and for students to get to class on time. Worcester State University will be offering college-level courses to Worcester public high school students through the Commonwealth Dual Enrollment grant. There is no cost to the student; tuition, books, and fees are included. Classes will be offered during the spring semester, January 21-April 28, 2016. To apply, students must fill out the online application and have a teacher or guidance counselor submit the online recommendation form. Applications are due December 23, 2015. The three courses offered are: English Composition, Physical Geography, and Survey of Math. To qualify, students need to have a minimum of a 3.0 high school GPA and be a junior or senior. Sophomores are welcome to apply, but will be placed on a waiting list. If spaces become available, we will place sophomores in the courses. See your guidance counselor for details. Reminder to students: Students need an ID card with authorized bus routes to enter the bus. If a student has forgotten their ID, they will not be issued a temporary bus pass. If a student has lost their ID, they must see Mrs. Milonopoulos in the main office to pay for a new ID. They will not be issued a temporary bus pass until they have paid for the new ID. Students with questions should see Ms. Quinlan in the 4th floor office or Mr. Creamer during 6th period only. Students must follow school rules to and from school while riding the bus. Failure to comply can result in school discipline and or loss of bus privileges. Any students who would like their birthday announced in the morning, the cost is $1. The funds collected will go to support school activities.